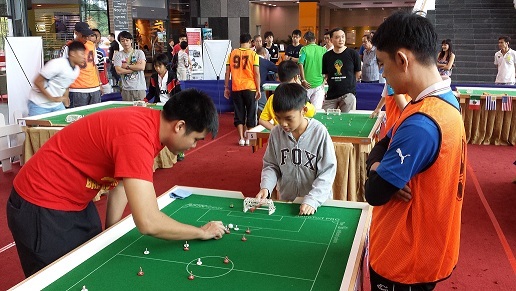 Last Sunday, the Open event of the ‘World Cup’ themed TFAS National Championships 2014 took place at the Atrium of SAFRA Toa Payoh. 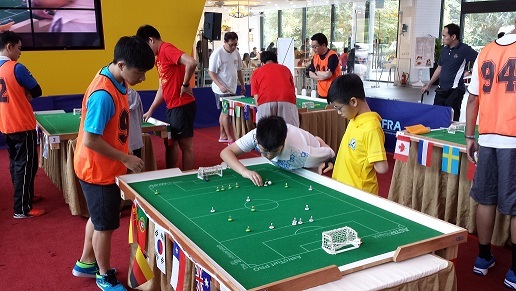 While the Junior event the day before drew 10 players, the Open event attracted a total of 27 players to contest for the ‘World Cup’. Besides Den Mulia Yusni (the defending champion from last year’s National Championships) and the usual top-ranked players in Singapore (i.e. 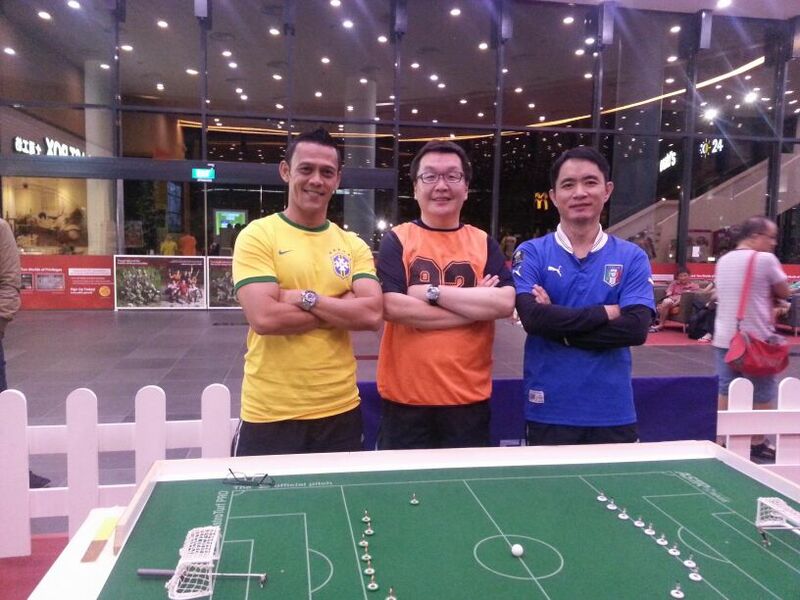 John Ho, Rudy Hesty, Kok Wee Tan, Michael Choong, Ezan Ahmad); a host of old-timers/veterans also returned to action for this tournament. Among them were Erza Aripin (former National Junior Champion), Gary Ong, Vikas Chandiramani, Sham Doulatram, Izham Sidek and brothers Arthur and Bernard Lim. Our up-and-coming young adults also threw their names into the hat such as Anas Rahamat, Henry Peh and Apple Oh – the only lady player in this year’s tournament. The top 3 Junior players from the day before – Giovanni Choong, Isaac Lim, Luke Lim – also participated for the experience and exposure; not forgetting experienced Junior Fadhly Fahmi and Japanese Junior Chihiro Takao. 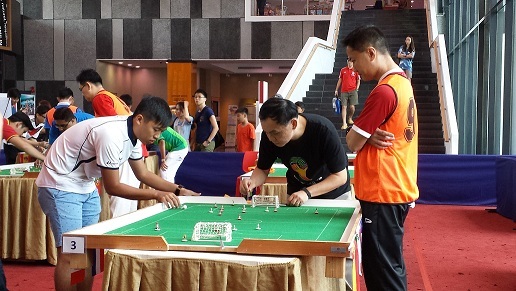 2 relatively ‘newcomers’ – Nic Tan and Nur Hashim – also joined in the fray while the father-son pair of Wai Mun and Eugene Lek made their debuts in their maiden tournament. 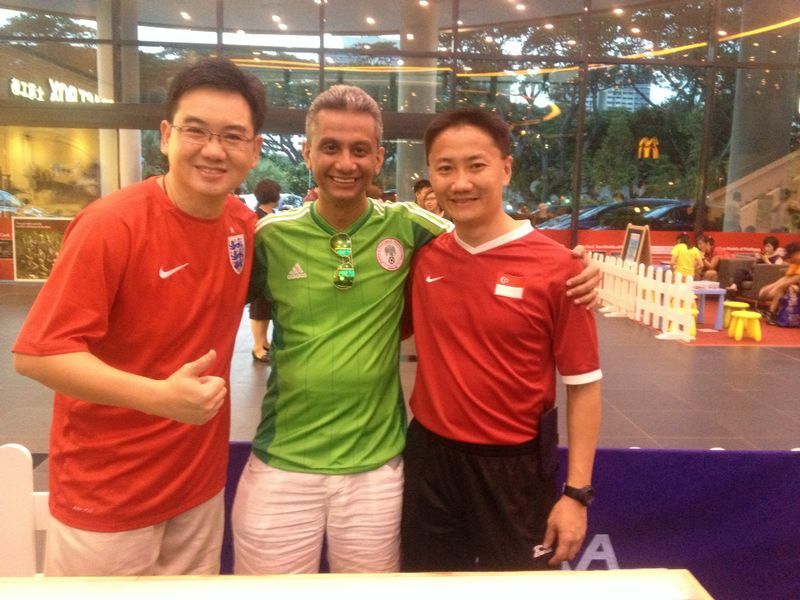 Our foreign friends – Kenzo Koi and Antonio Carabillo – also flew in from Japan and Hong Kong respectively to spice-up the tournament with an international flavour. Unfortunately, top-ranked French player Ouabi Rouis (winner of the last 2 preceding SG tournaments – the TFAS Cup and the Merlion Cup) had to withdraw at the last-minute due to a wrist injury that required surgery. 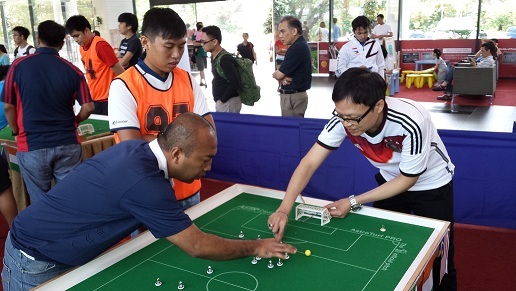 The 27 players were placed into 7 Groups – Group A had 3 players while Groups B to G had 4 players each. The top 7 ranked players were seeded into Pot 1 and lots were drawn to determine whuch Group they will each head. The seeds, as determined in accordance to the latest published FISTF World Rankings, were Antonio, Den Mulia, John, Kenzo, Rudy, Kok Wee and Michael. 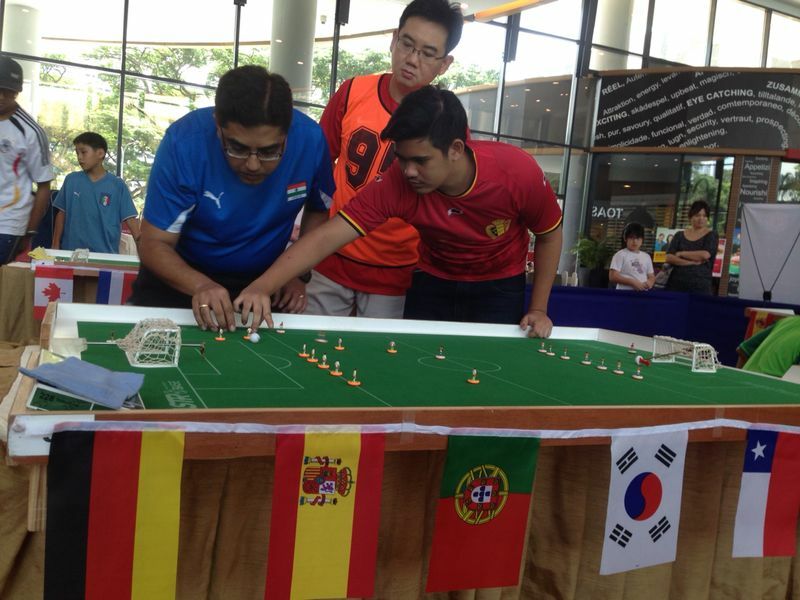 The remaining players were all placed into Pot 2 and lots were duly drawn by each player to decide which Group they play in. 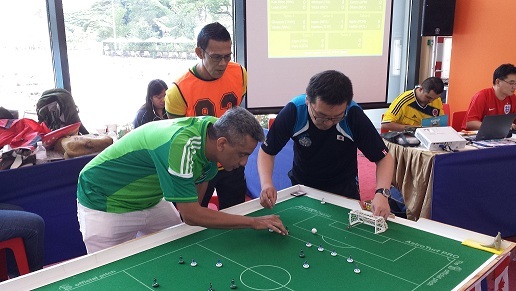 After the draw, Groups A to G were headed respectively by: Den Mulia, John, Antonio, Rudy, Kok Wee, Michael and Kenzo respectively. The winner of Group A and B qualify directly into the quarter-finals while the 2nd-placed players of Groups A and B join the top 2 players in Groups C to G in the barrage play-offs to determine the remaining 6 quarter-finalists. 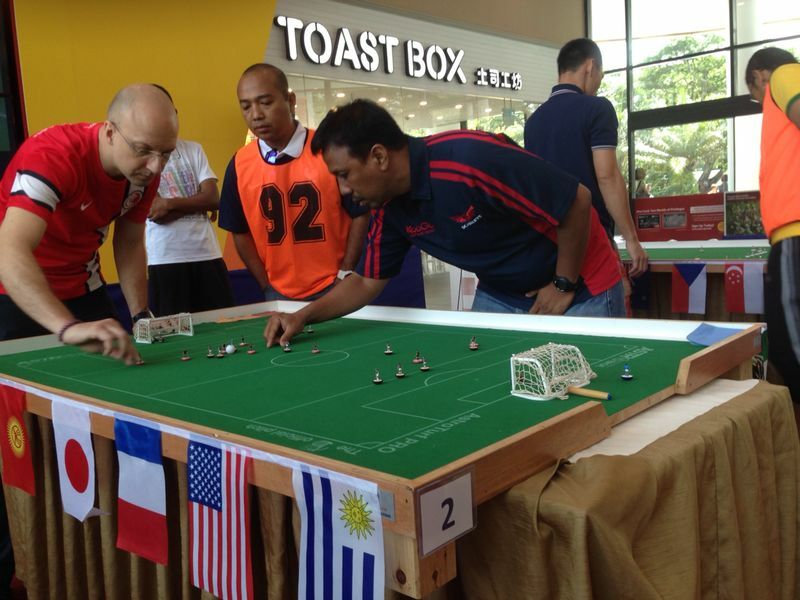 The Group stages started predictably with defending champion Den Mulia scoring the 1st goal of the tournament in his match against Wai Mun; which he ran out 5-0 winners. He eventually won Group A as expected. While the seeds of Groups C (Antonio), D (Rudy), E (Kok Wee) and F (Michael) played true to form and expectedly won their respective groups comfortably; things were anything but comfortable and expected for what lies in wait for both the seeds of Groups B (John) and G (Kenzo). Most notable was the performances of Nic in Group B. Following up his good form in the recent Stadium de Imagio Open in May 2014 where he finished Runners-Up, Nic put up another great performance to force 2-2 draws with both John and Erza. These 2 results, together with Erza beating John 3-1, meant that Erza won the Group while Nic nudged John down to 3rd place and out of the tournament!! Kudos Nic, well done!! In Group G, returning old-timer/veteran Sham, also put in a solid performance winning 3 games out of 3 for a 100% record – surprising quite a few people with victories over group seed Kenzo, 1 of the top-ranked SG player Ezan and fellow old-timer/veteran Gary. 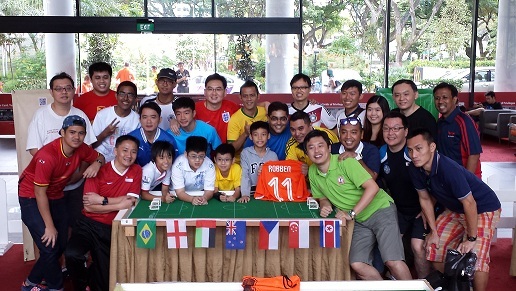 It was down to Kenzo and Ezan to fight for 2nd place with Ezan’s 3-1 win over Kenzo giving him the edge. 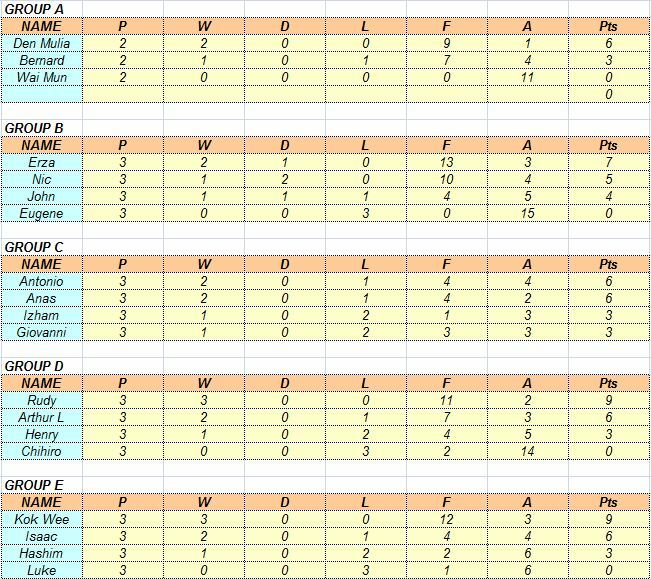 ** Antonio had to withdraw after the Group stage, so Anas and Izham were promoted to 1st and 2nd places respectively in Group C to advance to the barrage play-offs. No major surprises or upsets were in store and players who were expected to qualify for the quarter-finals duly took their places. However, not before tense affairs between Anas vs Arthur and Rudy vs Ezan. In both these games, nothing separates either players with no goals in both normal and extra-time. Both games were eventually decided on penalty shoot-outs with Anas winning Arthur 2-0 and Rudy winning Ezan 1-0. 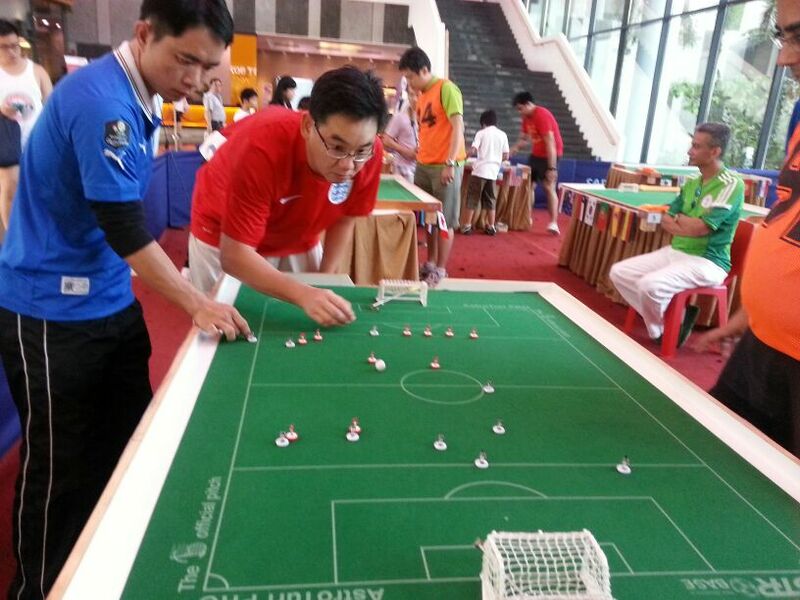 The quarter-finals saw yet another 2 tight and evenly match-ups between Kok Wee vs Rudy and Bernard vs Erza. 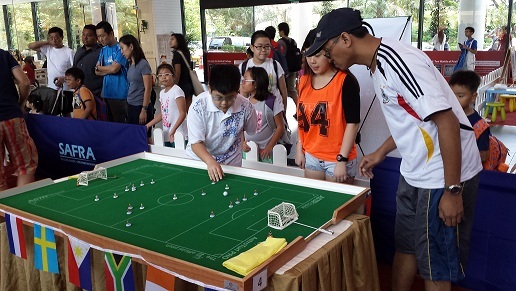 The game between Kok Wee and Rudy was tied at 2-2 after extra-time with Kok Wee prevailing 3-2 during the penalty shoot-out; while the game between Bernard and Erza was 1-1 after extra-time with Bernard prevailing 3-1 during the penalty shoot-out. 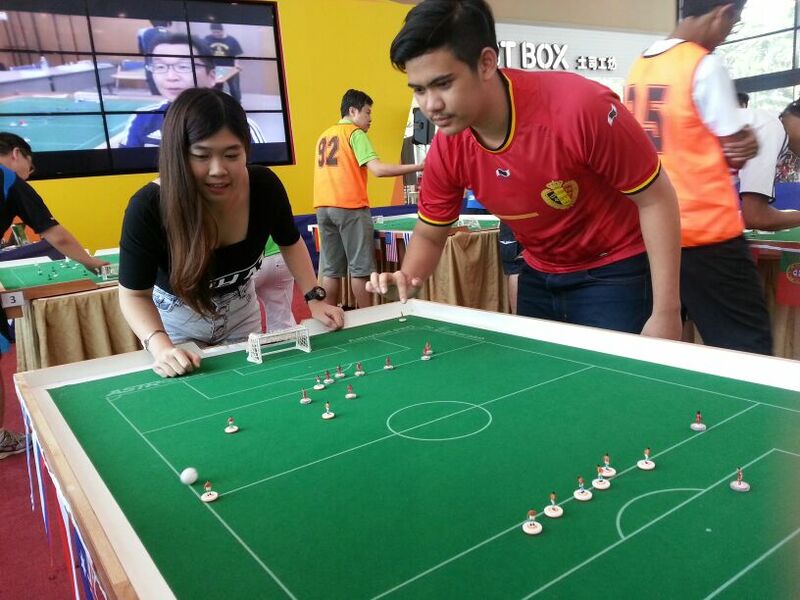 Elsewhere, Den Mulia and Michael duly won their games to take their places in the semi-finals. Continuing the trend from the barrage play-offs, both semi-finals were once again tense and tight affairs. 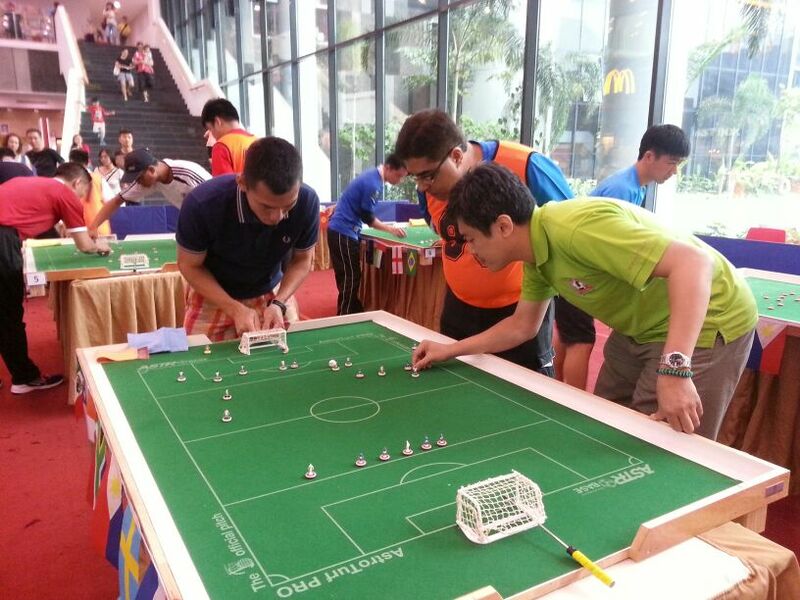 The 1st semi-final between Den Mulia and Kok Wee was tied evenly at 1-1 right up to the final 4 seconds with no clear winner in sight. However, Den Mulia displayed all the pedigree of a defending champion by scoring the all-important winning goal – with just a mere 4 seconds left on the clock – to take the game 2-1!! The 2nd semi-final between Michael and Bernard was a repeat of their quarter-final clash the weekend before in the Malaysia World Cup. Then, Michael emerged victorious on shots. Can Bernard turn the tables on Michael this time around? Unfortunately for him, Michael’s cool, calm and controlled style of play proved too strong. In the end, Michael ran out deserving 1-0 winners; having had more possession of the ball. 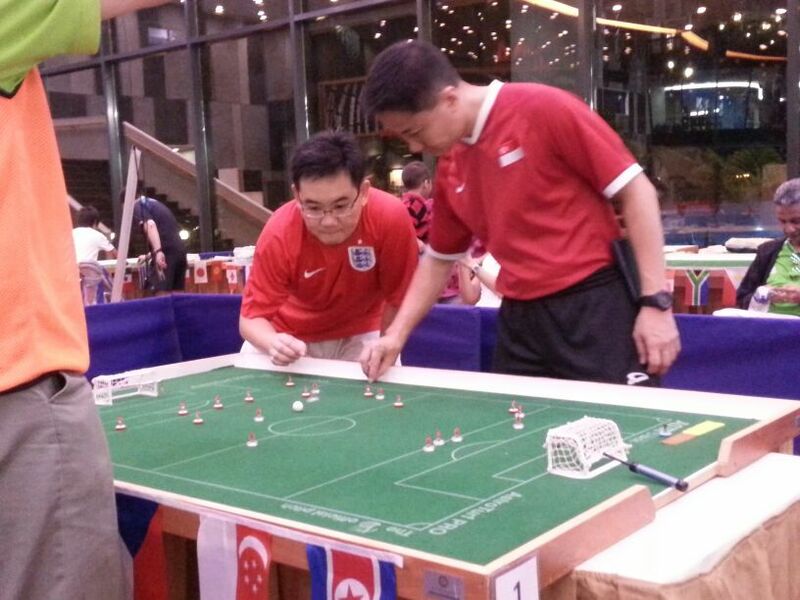 While some may argue that a third/fourth placing play-off is typically a meaningless and drab affair that is at best a consolation to the 2 losers of the semi-finals, try telling that to Kok Wee (Singapore) and Bernard (England). With live commentary provided by our very own Vikas, the 2 players played out an dramatic enthralling thriller right up to the very end and literally till the final whistle!! 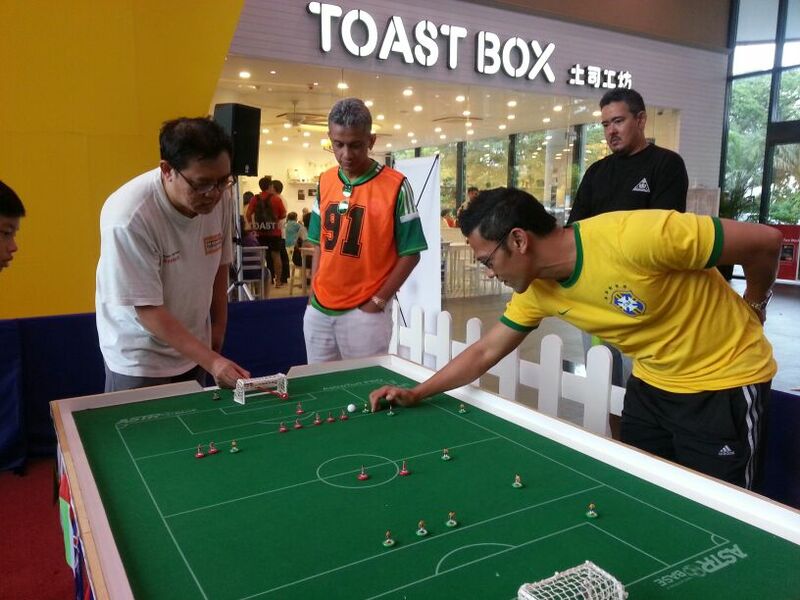 The match started with Bernard taking an early lead and seemingly in control of the game and his own fate. But soon after, Kok Wee, slowly but surely began to exert his influence on the game and started peppering shots at Bernard’s goal. 1 of these shots paid dividends and Kok Wee scored to draw level at 1-1 just before half-time. The 2nd half was an evenly-matched affair with both players having a fair amount of chances to take the lead, although possession-wise Kok Wee had the edge. The game remained tied at 1-1 till full-time and went into extra-time. The open end-to-end attacking style of play by both players continued in extra-time as both players went for the jugular in search of the winning goal. Kok Wee was rewarded in 1 of these attacks to score and take a 2-1 lead early in extra-time. With his momentum on the rise, Kok Wee continued to pile on the pressure in the hope of scoring a 3rd goal to kill off the game. Fortunately for Bernard, he managed to withstand the pressure and held on. With the clock ticking down with less than 30 seconds left, Bernard had a throw-in near the shooting area to create a shooting chance but completely fluffed it. What subsequently followed had many among the watching crowd skipped a heartbeat or 2. Kok Wee forced a throw-in only to give possession back. Bernard immediately launched the ball upfield but only to lose possession to Kok Wee; who subsequently played the ball out for a throw. At this point, there were 5 seconds left on the clock. From the ensuing throw-in, Bernard took 2 neat sharp touches to get into a shooting position; and with his 3rd touch, shot into goal in the last second of extra-time as the final whistle blew!! Dramatically and incredibly, Bernard had equalised to level the score at 2-2 and take the game into penality shoot-outs!! It had been an emotional roller-coaster ride for both players. For Bernard – to 1st take an early lead; yet for most part chasing the game for an equaliser; and to eventually score with the last flick of the game. 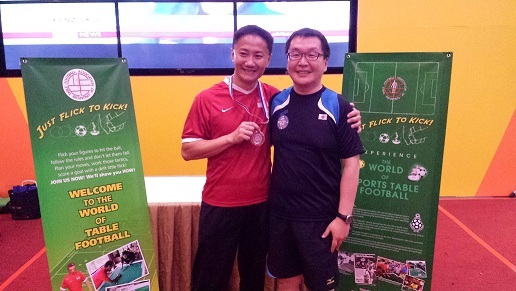 For Kok Wee – having recovered from the initial setback to take the lead; seemingly in full control to see out the game; and yet to concede a goal as the final whistle went. What a game!! 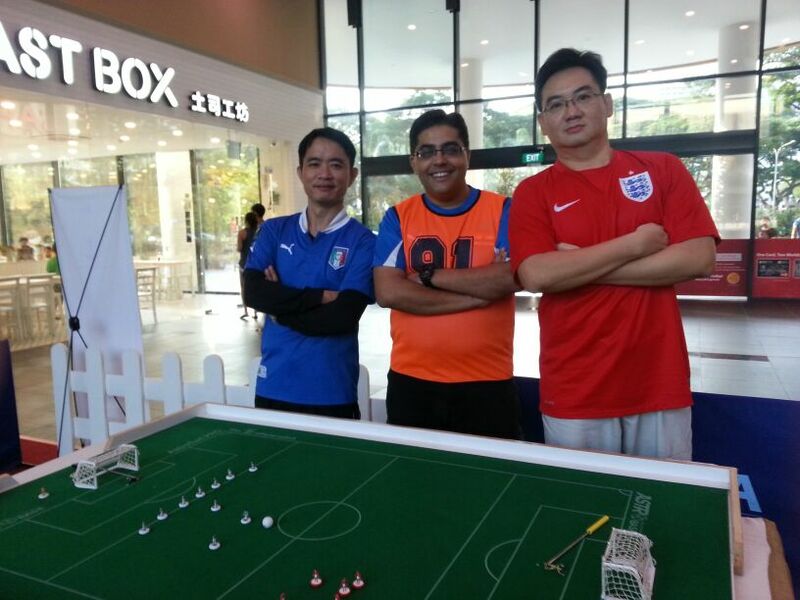 What a dramatic enthralling thriller and what a great showcase for the game of Subbuteo Table Football!! In the penalty shoot-outs that followed, Kok Wee had a bad day – missing all 4 of his shots with 3 hitting the cross-bar and 1 saved – perhaps affected by the events that had just happened i.e. 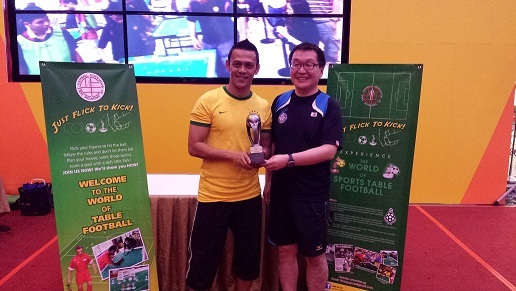 he had earlier also conceded a late goal to Den Mulia in the semi-finals with 4 seconds to go. Bernard, on the other hand, kept his nerves to score 2 out of his 3 shots to prevail 2-0 on the the day and take home Third Place. Congratulations Bernard!! After the unforgettable and dramatic third/fourth placing play-off, many in the watching crowd rubbed their hands with glee in anticipation of yet another exciting game – more drama, more drama and yet more drama!! And boy, they were not disappointed … what they witnessed was calmness personified in the face of adversity by the eventual Champion; and another heart-stopping game of epic proportions!! 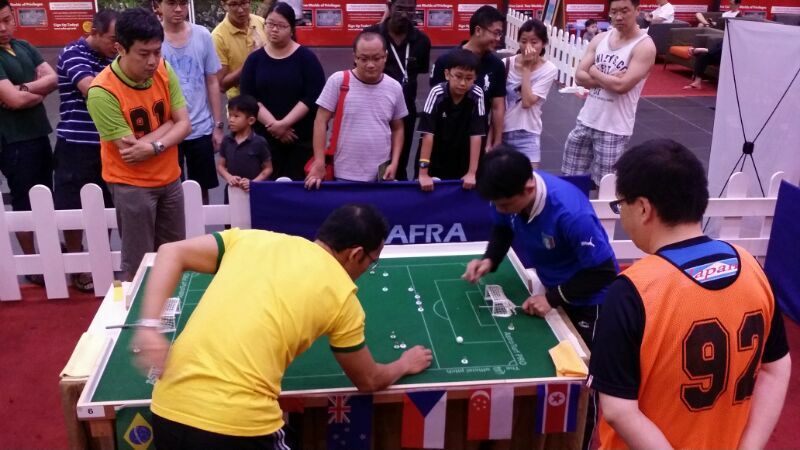 The final between Den Mulia (Brazil) and Michael (Italy) started like all other classic finals that we all know – cagey and tentative, with both players feeling out each other. It was a game of chess between Den (known for his attacking flair) and Michael (known for his controlled and tight possession playing style). The 1st half was all Den Mulia – true to his instincts – as he went on the offensive and capitalised on his attacking flair to take the game to Michael. This went on for most of the 1st half. To his credit, Michael did very well in his defensive game to hold on. It was 0-0 at half-time. As the game restarted for the 2nd half, in an obvious change in his tactics, Michael took the initiative and attacked Den Mulia straight from kick-off. This tactical change caught many in the crowd by surprise and had Den Mulia on the back-foot for long periods of the 2nd half. This time Michael was in control and looked the more likely to score to steal the winner. 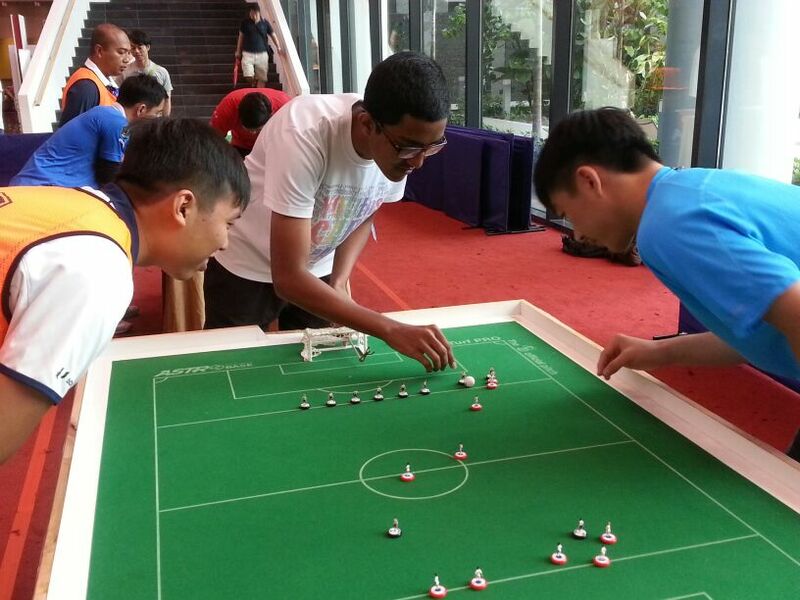 However, both players were evenly-matched and displayed an extremely high level of skill and possession control. And so it was still 0-0 at full-time. The period of extra-time did very little to separate the 2 players as the game looked headed for a stalemate. 30 minutes of normal time plus 10 minutes of extra-time could not determine a winner and the game had to go into penalty shoot-out. And this is where we witnessed a nerve-wrecking and nail-biting shoot-out of epic proportions!! Michael took a decisive 2-0 lead after 3 shots. And when Den Mulia missed his 3rd shot, he looked a goner and completely defeated. At this juncture, Michael seemed destined to be crowned the 2014 National Champion and bring home the Cup. However, as Michael took his title-winning 4th shot, the determined outgoing defending champion made a crucial save. That seemed to galvanise Den Mulia and proved to be the turning point!! With his confidence back and the winds blowing strong behind his tail, Den Mulia went on to score from his 4th shot to pull back 1 goal to make it 2-1. While the mathematical advantage still rested with Michael, the psychological advantage was clearly with Den Mulia – supported by loud cheers from the watching crowd. Michael had another bite of the cherry with his 5th shot – all he had to do was to score and the game will be over. Alas, Den Mulia kept his nerves better and made another fine save from Michael!! As Den Mulia lined up for his 5th shot, he was clearly in the ascendency and had all the momentum. 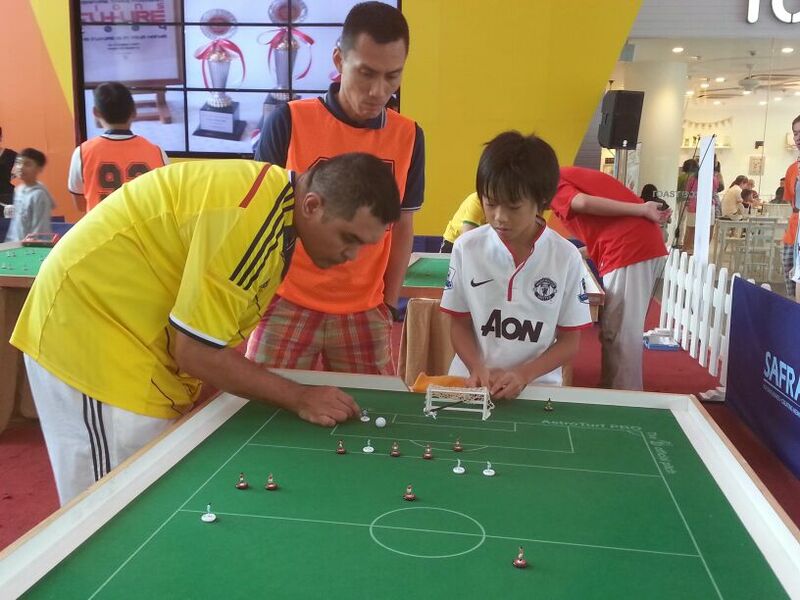 However, Michael could still win it yet again if he can deny Den Mulia from scoring!! Again, the defending champion held his nerves and scored a beautifully chipped goal into the top-left-hand corner of the goal to make it 2-2 and take the shoot-out into sudden-death. 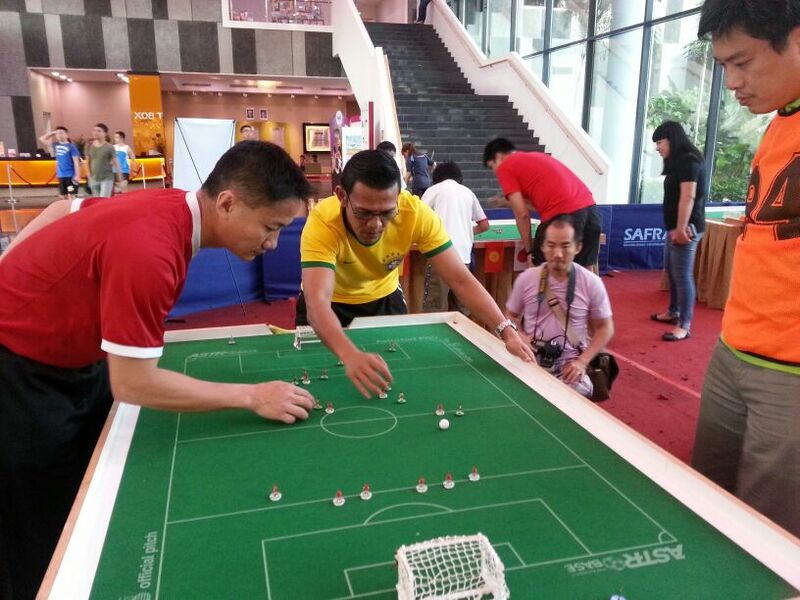 In sudden-death, Den Mulia was calmness personified as he made yet another crucial save from Michael. In the title-winning shot, the pedigree of the defending champion shone through as he scored from another beautifully chipped shot – this time into the top-right-hand corner of the goal to make it 3-2 to successfully defend his title of National Champion!! As a visibly relieved Den Mulia celebrated his victory and looked up to the heavens, he will probably be the 1st to admit that he had been very lucky to escape from the jaws of defeat to triumph. It was a remarkable performance by Michael as he almost pulled off an upset. Kudos to Michael!! … For pushing Den Mulia all the way to the cliff – literally a cliffhanger – as Den Mulia hung on precariously. To Den Mulia, we salute and congratulate you!! Champions make their own luck; and you had once again proved your mettle and showed why you are our true Singapore Champion and Asia’s No. 1!! Congratulatiions once again!! 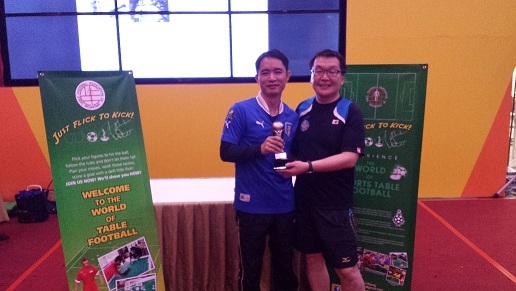 TFAS would like to thank all players who had participated in this tournament to make it a success. 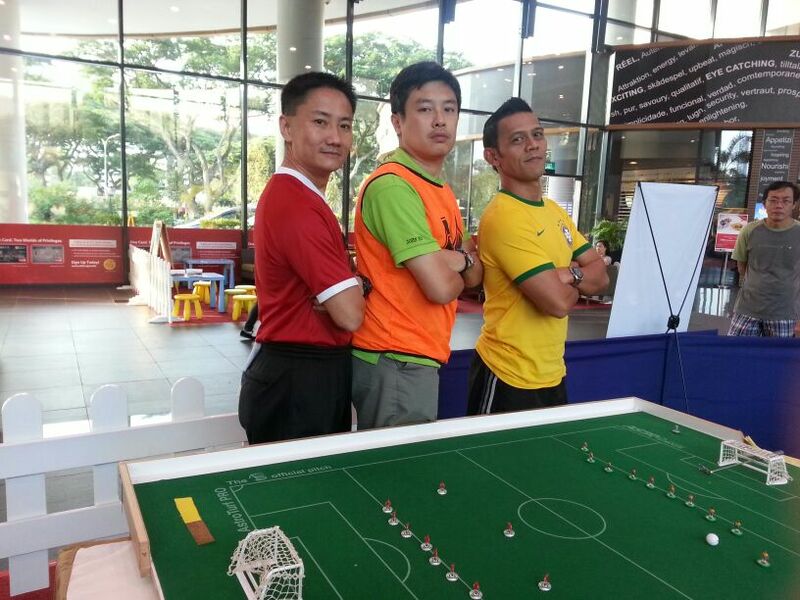 And especially to Kenzo and Antonio for travelling to Singapore to participate. Special thanks also to the WAGs of Bernard, Den Mulia and John for helping out with the score updates, picture/video taking and the promotion!! Last but not least, congratulations to all winners once again!! 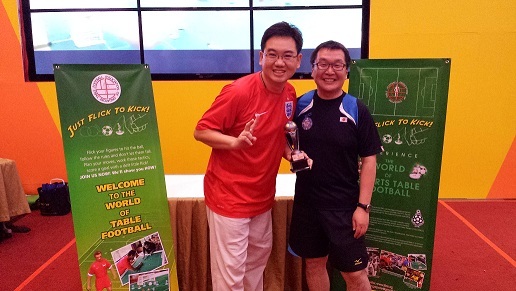 Click here to watch more video highlights of the TFAS World Cup 2014 Open Tournament on 29 June 2014.